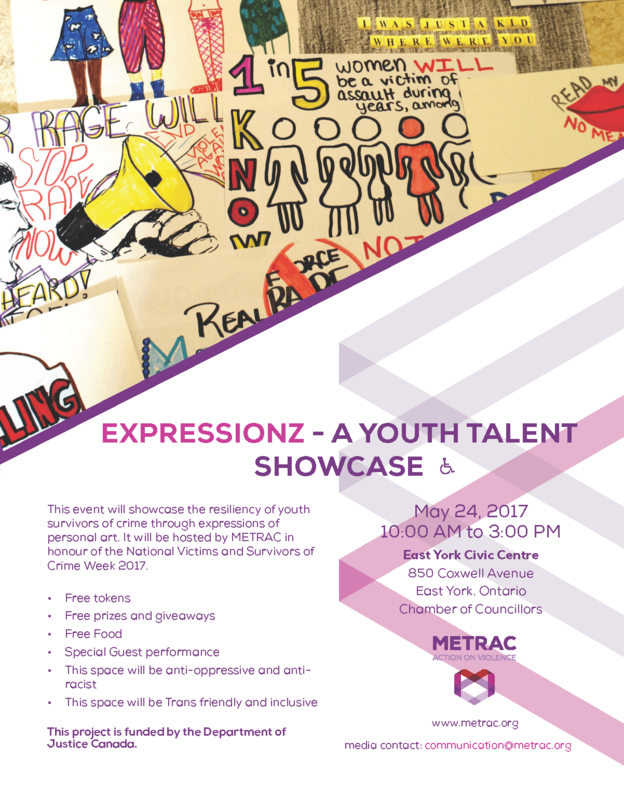 METRAC will be hosting Expressionz: A Youth Showcase, an event for National Victims and Survivors of Crime Week 2017, celebrating youth resiliency in the face of violence. This event will host a safe space for youth in high schools participating in METRAC’s ReAct program across Toronto to come together to raise awareness about the issues facing youth who identify as victims and survivors of crime and about the services, assistance and laws in place to help these victims, survivors and their families. Opportunities for mutual dialogue between victims/survivors of crime and service providers will be fostered throughout the day. Youth will learn more about laws and services available to them through presentations and materials provided to them. Youth will also have the opportunity for artistic expression/performance supported by local community artists and advocates, allowing youth to showcase their talents and their resiliency to overcome the adversity they have had or continue to have in their lives. This event is funded by the Department of Justice Canada, with in-kind support from the City of Toronto. For more information or media inquiries, contact communication@metrac.org.